Editor's note: We regularly update this buying guide to reflect the latest accessories on the market and to remove products that are no longer available. We've noted recent additions and removals in each section. For serious typing sessions--or if you just can't get the hang of the iPad's onscreen keyboard--an external keyboard offers the tactile advantages of real keys without sacrificing the iPad's portability and touchscreen features. The iPad supports almost any Bluetooth keyboard, but there are many, many keyboards on the market that are specifically made for use with the iPad. These tend to be designed for portability, and they usually include special iPad-function keys for adjusting volume and screen brightness; controlling media playback; opening iOS's Spotlight-search screen; going to the Home screen; and more. Some even offer dedicated buttons for cut, copy, and paste. Most iPad keyboards are integrated into some sort of protective case, although a few are standalone models; regardless of the design, most include rechargeable batteries that last for weeks or months on a charge. There are a few things to consider when shopping for a keyboard for your iPad. Always on or removable? If you frequently need a physical keyboard when using your iPad, you'll appreciate the convenience of a keyboard built into a case, as the keyboard will always be with you. If, however, you use an external keyboard infrequently--or you just like to use the iPad unencumbered for non-typing tasks--you may find a form-fitting, folio-style keyboard case to be a hassle, as it can be difficult to remove. Keyboard shells, described below, are a nice compromise, and standalone keyboards offer the most flexibility. Portability versus usability With the exception of standalone models, iPad keyboards involve usability tradeoffs: The thinner the keyboard, the worse the feel of the keys; the smaller the keyboard, the more crowded the keys will be, or the more you'll find keys that are the wrong size or in the wrong locations. (Standalone keyboards generally offer standard key feel and size, a standard key layout, and a typing experience closer to that of a desktop keyboard.) You'll need to decide which tradeoffs you're willing to make in the name of portability--especially if you're a touch typist--and check for these tradeoffs when shopping. A literal hands-on test is immensely valuable if you can get one; otherwise, be sure the store or website you're buying from offers a good return policy. With that out of the way, here's a look at the main types of iPad keyboards available, along with my recommendations for a few of the best in each category. If you're looking for a keyboard for the iPad mini, I've included a separate section for the mini at the end of this guide. Easily the most-common type, these keyboards are integrated into a full-body, folio-style iPad case. The all-in-one design of folio keyboards is convenient, and most models make it easy to type on your lap--no desk or table required. These models, along with keyboard shells (below) also tend to include the thinnest keyboards. However, folio keyboards have a few drawbacks that can significantly affect usability and comfort. For starters, the actual keyboards tend to be cramped and have small, poor-quality keys, sometimes using odd layouts. Most also limit the iPad to landscape orientation--even though portrait orientation is often better when typing traditional documents--and a single propped-up angle. It can also be inconvenient to use your iPad as a tablet while in the case (you flip the keyboard behind the iPad, making for a bulky package), yet it's often a hassle to remove the iPad from the case--which also means you end up carrying the keyboard even when you don't need it. My recommended models all have smaller-than-standard keyboards, but they otherwise make solid attempts to avoid these flaws; they also all support the iPad's magnetic sleep/wake feature. Recommendations: Zagg's $130 ZaggKeys ProFolio+ (iPad 2, 3, 4) is pricey and supports only a single (rather steep) iPad angle. But the keys are easy to type on and--yes--backlit. In addition, the sturdy case offers all-over protection and a nifty back cover that redirects iPad-speaker audio towards you; it's easy to remove your iPad from the case; and it's the thinnest folio-style keyboard around. (The $100 ZaggKeys ProFolio loses the backlit keys.) If you can still find Zagg's older ZaggFolio (iPad 2), you'll get better keys, although in a slightly flimsier case. In terms of the traditional "looks like a leather folio" keyboard cases, the best ones I've seen are both from Logitech. The $130 Solar Keyboard Folio for iPad (iPad 2, 3, 4) has a very good keyboard, is thinner than the typical leather/pleather folio, and isn't too difficult to remove your iPad from. But my favorite feature is that the Folio offers two angles, one for typing and another for video/photo viewing; when in the latter position, the keys on the bottom row of the keyboard change to media- and volume-control buttons. And unlike most of the other keyboards here, the Solar Keyboard Folio charges its built-in battery using ambient light--just make sure you close the case and place it solar-cells-up every once in a while. Logitech's $100 Keyboard Folio for iPad (iPad 2, 3, 4) is a bit heavier and thicker than the Solar Keyboard Folio, and it doesn't include the special media-viewing mode. But the non-solar Keyboard Folio feels sturdier, uses slightly larger keys, looks nicer (it's even available in your choice of colors), and has a special fold in the cover that lets you flip your iPad around on top of the keyboard for use as a standard tablet. My only real complaint here is that the keys are slightly convex, instead of concave--a mysterious design decision that makes touch-typing a bit more difficult than it should be. Honorable mentions: Most other models in this category are simply bulky leather (or faux-leather) folios with a disappointing keyboard tacked onto the inside of the screen cover. (A few I previously recommended have since been discontinued.) However, Belkin's latest model, the Ultimate Keyboard Case for iPad ($100 in black; $130 in silver/white) is a cautious recommendation, especially for non-touch-typists. The downsides are that the keyboard is more cramped than those of the recommended models above; an otherwise nifty Siri button is located where the left-hand Command key should be, and Belkin has overlaid the special-function keys with the number keys in the top row (you access the former using the Fn key). But the Ultimate Keyboard offers three different screen angles and a thin, rigid shell; you can flip the keyboard behind the iPad for traditional tablet use (the keyboard automatically turns off when your iPad isn't propped up); and the keyboard is otherwise pretty good. Latest update: Added Logitech Keyboard Folio. Removed Adonit WriterPlus (recommended), which has been discontinued. Removed mention of Belkin Keyboard Folio for iPad 2 and Kensington KeyFolio Pro Performance Keyboard Case (honorable mentions), which have been discontinued. These models essentially turn your iPad into a laptop: The iPad acts as the laptop screen, while the keyboard and its surrounding enclosure, attached by some sort of hinge, play the role of the laptop base. The downsides to most clamshell keyboard cases are that they tend to add a good amount of weight and bulk to your iPad; they usually make it difficult to use your iPad as a tablet when you're not typing; and they use smaller-than-normal keys in a cramped layout. But the quality of those keys is often a step up from that of the average folio-case keyboard; the laptop-style design works well for typing on your lap; and most offer a good range of screen angles. Like folio-style models, most clamshells hold the iPad in landscape orientation, though you may find ones that let you prop up the tablet in portrait orientation. The available options are significantly better today than when I wrote the first edition of this guide. Recommendations: ClamCase is the best-known vendor of clamshell keyboard cases, and for good reason: The $169 ClamCase Pro (iPad 2, 3, 4) is a great combination of clever design, solid iPad protection, and a very good (if slightly cramped) keyboard. Though on the heavy side (three pounds including your iPad), this well-built clamshell encloses your iPad in an attractive, aluminum-and-plastic case that looks and functions almost exactly like a laptop--so much so that while testing it, I constantly tried to use a palmrest trackpad that doesn't exist. Flip the keyboard/base around towards the back, and the solid hinge makes a great stand for watching video, or rotate the base flat against the back of the iPad to turn the entire package into a thick tablet. (Just be sure to turn off the keyboard to avoid accidental typing.) The keyboard itself is one of the best I've seen in a keyboard case: It's a bit cramped, and the modifier keys are on the small side, but all the keys are in the correct place, it's got a nice array of special-function keys, and there's little here that will frustrate a touch-typist. The ClamCase Pro offers the best on-your-lap typing experience of any iPad keyboard case I've tested. ClamCase's $149 standard ClamCase--available in black, white, or black/white, with specific versions for each iPad generation--is bulkier, uses an all-plastic case, and uses keys that aren't as good, but it's still a decent option if you insist on a clamshell model. Honorable mentions: New Trent's $40 Airbender Keyboard Case (iPad 2, 3, 4) has a keyboard that's a tad more cramped than those of the Brydge+ and ClamCase models, its keys feel just OK, and it commits the same key-layout sin with the Up Arrow key as the Brydge+. But the Airbender offers some unique and welcome features: After lifting the "screen," you can rotate the iPad into portrait orientation--in fact, it's the preferred orientation. (The hinge/stand isn't very sturdy in landscape orientation.) In addition, the hinge/stand can detach from the keyboard, letting you create a more ergonomic typing station by placing your iPad and the keyboard at different levels. And if you want to use the iPad on its own, a quick-release latch on the stand lets you detach the iPad, still clad in the Airbender's thin, protective top case. If the keys themselves were better, this might be the keyboard case I'd use. Latest update: Updated prices for the Airbender Keyboard Case and the polycarbonate Brydge+. These models are the thinnest and lightest of the keyboard cases. 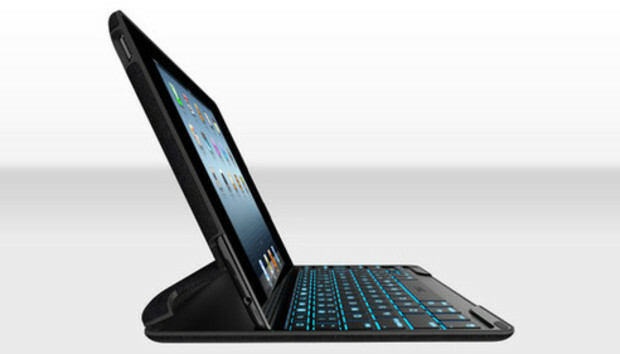 They integrate a thin keyboard into a rigid shell that protects the front or back of the iPad in transit. (Most cover the iPad's screen, leaving the backside exposed.) When you're ready to type, you pop the iPad out of, or pull it away from, the shell; stick it in a prop-up slot above the keyboard; and start typing. Most keyboard shells offer only a single angle for your iPad, though they often let you use your iPad in your choice of portrait or landscape orientation. As with clamshell-case models, the keyboards here tend to be a bit cramped, and the keys are usually smaller than normal; the models I've recommended are nevertheless quite usable, and they have good keys. Keyboard shells can be used on your lap if you're careful, but they're usually less stable on your lap than folios and clamshells. Recommendations: Logitech's $100 Ultrathin Keyboard Cover (iPad 2, 3, 4) is a personal favorite thanks to its clever design, thin profile, light weight, very good (if slightly cramped) keys, and standard key layout. Instead of gripping the edges of your iPad, the Ultrathin Keyboard Cover uses a Smart Cover-like hinge that attaches magnetically to the edge of your iPad; the keyboard then flips closed (again, sticking magnetically) to protect your iPad's screen. When you're ready to type, you just flip the keyboard away from the screen, give it a gentle tug to detach the hinge, and then stick your iPad in the slot above the keys. Combine the Ultrathin with a Smart Cover-compatible back shell, and your iPad is completely protected in transit. Zagg's $130 ZaggKeys Pro Plus and $100 ZaggKeys Pro (iPad 2, 3, 4) each use the same solid keyboard as the company's ProFolio+, above, but in a keyboard-shell body that clings magnetically to the front of your iPad during transit. As with the Logitech Ultrathin, you just detach the ZaggKeys Pro from your iPad, prop your iPad in the slot above the keys, and type away. The Pro Plus includes backlit keys; the Pro does not. Honorable mentions: Belkin's FastFit Keyboard Cover (iPad 2, 3, 4) is similiar in design to Logitech's Ultrathin Keyboard Cover, but without the magnetic hinge. Instead, it's got a magnetic lip along the back edge that holds the iPad in place during travel. It bests the Ultrathin by offering two grooves for your iPad, so you get a choice of two screen angles. However, the FastFit's keys are a bit smaller; the square shape of those keys feels a bit off, and the FastFit makes the same touch-typist-thwarting mistake with the Up Arrow key as the Brydge, above. Instead of a physical keyboard, several companies offer overlays that lie on your iPad's screen--generally securing using magnets or some kind of sticky silicone--and add tactile feel to the iPad's software keyboard. For example, Touchfire's $50 Screen-Top Keyboard (iPad 2, 3, 4) is a clear, silicone overlay that adds little nibs to each virtual key's "top," as well as slighty raised ridges around each key. The Touchfire does make typing a bit more tactile for touch-typists, but the overall experience isn't otherwise much different than typing on the bare screen. And I found that because of the tactile feel, I frequently rested my fingers on the Touchfire's key areas, which resulted in accidental key taps. The $35 TacType (formerly called the iKeyboard; iPad 2, 3, 4) instead uses a rigid-plastic frame with clear, bubble-like key overlays. This approach prevents accidental keypresses, and I liked typing with it better than with the Touchfire, but I found the bubbles to be a bit too difficult to press compared to good physical keys. Keyboard overlays can be convenient--they take up quite a bit less space than a full keyboard, and they don't require batteries or charging--but I personally don't find them to be enough of an improvement over the iPad's onscreen keyboard to make them worth the cost. And, of course, you must move them out of the way whenever you want to use the iPad's screen normally. A standalone keyboard must be carried separately from your iPad, and it usually requires you to buy a separate iPad stand (or at least use a case with a built-in stand). But standalone keyboards offer a number of advantages over other types of iPad keyboards: Standalone keyboards usually offer full-size, high-quality keys arranged in a standard layout; with a good stand, you get much better ergonomics than with a keyboard case; when you don't need the keyboard, you can leave it behind to travel light; and you don't need to buy a new one when you upgrade your iPad in the future. A standalone keyboard also lets you use your favorite case, and it works with any iPad, iPhone, or iPod touch. (Most can even be used with a Mac or Windows PC.) For all these reasons, this is my favorite type of iPad keyboard unless you spend more time with a keyboard than without--and even then, I'd at least consider a separate keyboard. The good news is that there are plenty of very good standalone iPad keyboards out there, and all of them work with any generation of iPad. Recommendations: Although not specifically designed for the iPad, Apple's $69 Wireless Keyboard is a great fit for the company's tablet. The keyboard is compact, light, and sturdy, yet it offers a full-size keyboard with the same great keys as Apple's laptops. And many of its Mac-focused special-function keys perform similar duties when used with the iPad (namely, screen brightness, media control, and volume level; the Eject key also toggles the onscreen keyboard). You may prefer some of the other options here thanks to additional special-function keys and lighter weight, but Apple's Wireless Keyboard remains one of the better options--especially if you've already got one for your Mac that you can borrow when traveling with your iPad. Logitech's $100 Bluetooth Easy-Switch Keyboard is slightly wider than Apple's keyboard, but the same depth and a little thinner. Despite its thin profile, the Easy-Switch uses fantastic, concave-top keys in a fully standard layout, along with a full complement of special-function keys. Even better, all of the keys are backlit for easier dim-light typing. And the Easy-Switch can pair with up to three devices--for example, an iPad, an iPhone, and a Mac--simultaneously, letting you instantly switch to whichever computing device happens to be sitting in front of you. Most iPad keyboards connect wirelessly, using Bluetooth. But there are times when Bluetooth isn't an option, such as when you're on a plane and not allowed to use wireless technology. And some situations just aren't suited to Bluetooth pairing, such as a classroom full of iPads that share a keyboards or two. In these circumstances, a wired keyboard is a better option, and the best I've seen is Macally's Full Size Keyboard for iPad, iPhone and iPod Touch (a.k.a., the iKey). Available in two versions, the iKeyLT (shown at right, for Lightning-connector devices) and the iKey30 (for older, 30-pin-dock-connector devices), this $60 keyboard features full-size keys in a standard layout, and it connects to your iPad (or other iOS device) using a three-foot cable. The downside to this approach is that your iPad's stand or case must keep the tablet's connector port accessible, but the upside is an instant, no-hassle connection, along with the capability to quickly move the keyboard between devices. The iKey includes a few other niceties, as well, including dedicated keys for undo, redo, and taking a screenshot, as well as keys for typing €, £, ¥, .com, .net, .org, and .biz. Honorable mentions: Amazon's $30 AmazonBasics Bluetooth Keyboard with Mini Travel Stand for iPad, New iPad Mini, iPhone and Genius's LuxePad 9000 Ultra-thin Bluetooth Keyboard for iPad ($60 MSRP; roughly $35 at street prices) are variations on the same keyboard--the Amazon model is black and about half an inch shorter from front edge to back, while the Genius version is white and slightly deeper. Neither is as solid as the best models here, but each weighs under nine ounces, and apart from a difficult-to-use pod of arrow keys, each is a solid keyboard at a great price. Logitech's $80 Wireless Solar Keyboard K760 is similar to the Easy-Switch in that it offers a very good iOS-focused keyboard that pairs with up to three devices. But it lacks the Easy-Switch's key backlighting, and while its solar-powered battery-charging system is convenient, the added space required by the solar cells makes the K760 considerably larger than the Easy-Switch. Still, it's a great standalone keyboard if you'll generally keep it with your computer but want to be able to use it with your iPad in a pinch. Logitech's third entry in this category--an impressive feat--is the $70 Tablet Keyboard for iPad. This model sports good keys, feels rock-solid, and comes with a hardshell keyboard case that flips open to double as an iPad stand. However, the Tablet Keyboard is relatively heavy--with the case it weighs nearly 22 ounces--and it omits dedicated F-keys in favor of fn-key-modified numeral keys. Targus's $64 Bluetooth Wireless Keyboard for iPad features large, easy-to-press keys and even an fn-key-activated embedded numeric keypad (like the one on many older Apple PowerBooks). While this model isn't as solid-feeling as many of the other models recommended here, it's light (just 9.5 ounces) and it fits full-size keys in a compact package. Kensington's $70 KeyStand Compact Keyboard & Stand offers a compact keyboard, rather than a full-size version, but with the exception of a right-hand Shift key that's too far to the left, all the keys are in the correct places. What the KeyStand has going for it is a slim profile and a built-in stand for your iPad. With its semi-rigid, four-panel cover wrapped around it, the KeyStand is just half an inch thick. But unwrap the cover and fold it, Smart Cover-like, into a triangle, and it forms a stand that's sturdy enough to hold your iPad in landscape or portrait orientation. Take the ZaggFolio, mentioned above, and strip it down to just the keyboard, and you get the $80 ZaggKeys Flex. With a footprint of just 9.5 by 4.7 inches, and only a third of an inch thick, the Flex is the smallest standalone keyboard that I've tested that doesn't induce typing frustration. It also comes with a rigid travel case that folds out to double as an iPad stand (though a gap in the back of the stand means it can't prop up a portrait-orientation iPad mini). And at just over 11 ounces with the case/stand, and under 7 ounces without, the Flex won't add much to your load. One complaint: The dedicated "Siri" key in the lower-left corner of the keyboard is really just a second Home-screen button...which means that if you accidentally hit it (which isn't difficult to do given the keyboard's smaller-than-standard layout), you're whisked out of your app and back to the Home screen. Latest update: Added Macally iKey keyboards and Zagg ZaggKeys Flex. Standalone stands and cases for keyboards: If your iPad's case doesn't include a suitable stand, you'll need one to prop up your iPad when using an external keyboard. My current favorites for travel are Griffin Technology's $30 Xpo Compact Universal Tablet Stand, Twelve South's $40 Compass Mobile Stand, and Rain Design's $50 iSlider iPad Pocket Stand. The Xpo, which offers one upright and one onscreen-typing angle, is surprisingly sturdy, but it folds into a tiny, 1.7-ounce package. The Compass is heavier (6.8 ounces) and similarly offers one upright and one typing angle, but it's more stable than the Xpo for an iPad in portrait orientation. The iSlider (7.5 ounces) is bulkier, but it's also sturdier, and its clever design offers a range of angles, from nearly horizontal to nearly vertical. If you'll mainly be using an iPad-keyboard combo at your desk, consider Heckler Design's $59 @Rest for iPad, a heavy, rock-solid stand that offers several angles and compatibility with a range of cases; or Rain Design's $50 iRest Lap Stand, which doubles as a comfortable stand for propping up your iPad in your lap when you're lounging. If you'll be using Apple's Wireless Keyboard, my favorite solution is Incase's $30 Origami Workstation (shown above with the Apple Wireless Keyboard), which encloses your Wireless Keyboard in a sturdy travel case that unfolds into a solid iPad stand when it's time to get to work. The stand even works in a pinch for typing on your lap. Another good option is the Touchtype ($50 for polyurethane; $100 for leather), a folio-style case that holds both your iPad and Apple's Wireless Keyboard. When you're ready to type, slip the keyboard out of the case and the case becomes a iPad stand for either portrait- or landscape-orientation use. You might also consider a pouch or bag for carrying your standalone keyboard. WaterField Designs offers a number of nice options, including a couple that hold your iPad and a keyboard. I personally use WaterField's lightweight, padded Keyboard Socket ($15) with a number of the standalone keyboard recommended here. If you generally use an external keyboard only when at your desk, you might want to consider forgoing travel-friendly size and weight in favor of some desktop niceties. Several vendors make keyboards designed to be used at a desk that add features you won't find in a portable keyboard. Other vendors make keyboards that can pair with multiple devices--say, your desktop computer, your laptop, and your iPad--and let you easily switch your Bluetooth connection between those devices, letting you use a single keyboard with all your gear. You'll still need a stand, but you'll have one less keyboard on your desk. Recommendations: I already recommended (in the standalone-keyboard section, above) Logitech's excellent Bluetooth Easy-Switch Keyboard and Wireless Solar Keyboard K760. Each of these models can pair with multiple devices and work great as a keyboard for both an iPad and a desktop computer simultaneously. If you prefer a compact keyboard, the $50 Slim One Keyboard is based on the same concept as the Tactile one, but instead of a full-size keyboard with a number pad, the Slim is about the size of Apple's wired keyboard and uses similar flat, low-profile keys. Those keys are pretty good as iPad keyboards go, though they're not quite as good as the keys on Apple's own keyboards. Both One keyboards are handy if you tend to use your iPad at your desk for, say, reading and posting to Twitter, or for taking quick notes. Honorable mentions: Matias's $100 One Keyboard is similar to the Tactile One but uses less-expensive (and less-tactilely-pleasing) keys; it also includes a USB 2.0 hub instead of USB 3.0. In time, Apple's iPad mini may turn out to be even more popular than the full-size model. But the mini's smaller screen means that it's even more difficult to do serious typing--which for some people will make a physical keyboard that much more appealing. However, all the usability tradeoffs I mentioned for iPad keyboard cases affect iPad mini keyboard cases even more. Because the iPad mini has a considerably smaller footprint, any keyboard case that tries to match that footprint must incorporate an even more-cramped keyboard, with even smaller keys, than would a keyboard for a full-size iPad. Most iPad mini keyboard cases we've tested omit some keys altogether, or at best relegate them to fn-key-enabled functions of remaining keys. I've tested a number of iPad mini-sized keyboard cases, and while they vary in design and key quality, I've found most of them to be exceedingly frustrating to use for touch-typing. A number of them have keyboards that just feel cheap and flimsy, and most are so cramped, and have enough keys in non-standard locations, that I couldn't type a sentence without multiple errors. Others, such as Logitech's Ultrathin mini and Zagg's ZaggKeys Mini 7, use higher-quality keys, but in the case of the Ultrathin mini, some are just too small for comfortable use, and on the Mini 7, larger key size has been achieved by overlaying commonly used keys, requiring the fn key to access the overlays. In short: If you're a hunt-and-peck typist, many iPad mini keyboard cases may be acceptable to you, but touch-typists like me will largely be disappointed. That said, there are a few models that stand out from the rest. Recommendations: I don't have any strong recommendations here. If you're a touch-typist, and you don't need to type on your lap, consider going with a standalone keyboard instead. You'll get a much better typing experience, you won't ruin the iPad mini's thin profile and light weight, and you can leave the keyboard behind when you want to travel light--which, if you've got an iPad mini, is likely a good deal of the time. Honorable mentions: If you truly need a keyboard that fits the iPad mini's profile, the good news is that there are more options out there today than when I previously updated this guide. If you don't mind a bit of extra bulk, Zagg's $90 ZaggKeys Mini 9 forgoes an iPad mini-matching footprint in favor of a better typing experience. The Mini 9 is about an inch and a half wider than the Mini 7 (9.6 versus 8.1 inches), but the same depth and thickness. Your iPad looks a bit odd in the Mini 9's too-long case, but it fits snuggly (almost too snuggly--it's a bit of a challenge to remove the iPad). In return for putting up with this extra length, you get a keyboard that's about the same size as you'd find in a standard iPad keyboard case: fairly cramped but entirely useable, with all the keys in the correct places. It even works in your lap. This is my personal favorite at the moment, despite the larger-than-a-mini size. Finally, New Trent now has an iPad mini-sized version of the Airbender Keyboard Case mentioned above. Like the full-size version, the $40 Airbender Mini has a cramped keyboard with keys that feel just OK. But also like its larger sibling, after opening the case/screen, you can rotate the iPad into portrait orientation, and the hinge can detach from the keyboard to become a stand for a more ergonomic typing setup. A quick-release clip lets detach your iPad completely from the stand/hinge for use sans keyboard, but whereas the full-size Airbender uses a simple back shell for your iPad, the Airbender Mini's case section is all-over protective: There's a rigid shell on the back; a plastic front with a use-through, transparent screen cover; and a silicone jacket that wraps around everything. As with the full-size Airbender, if the keyboard itself was better, this might be the keyboard case I'd use for my mini. Latest update: Revised iPad mini section considerably. Added ZaggKeys Folio, ZaggKeys Cover, and Airbender Mini.